We’re cranking through chores (will the dusting never end?!!) and food prep for Thanksgiving, so time is at a premium, but I can’t let myself break my chain of weekly posts. 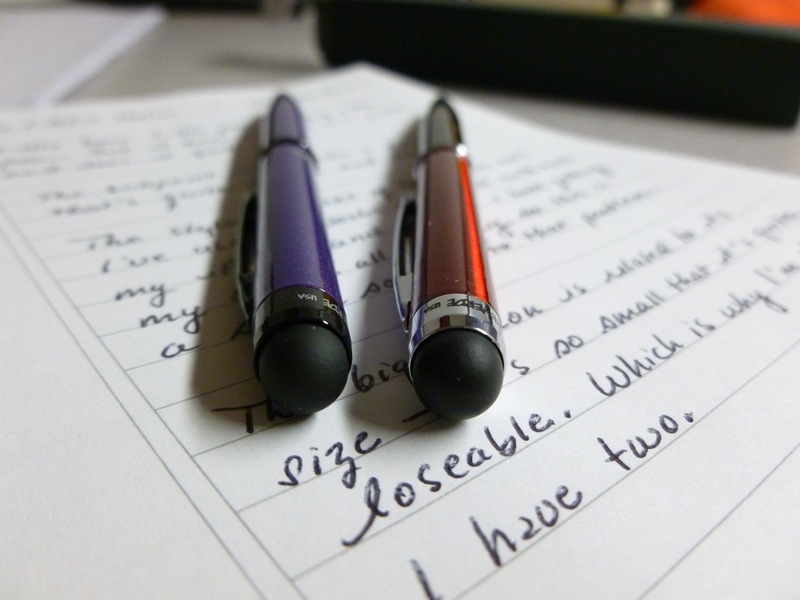 It makes sense, then, to write about a little pen when I only have a little time. One is a bit worn, the other’s still in tip-top shape and is in reserve. 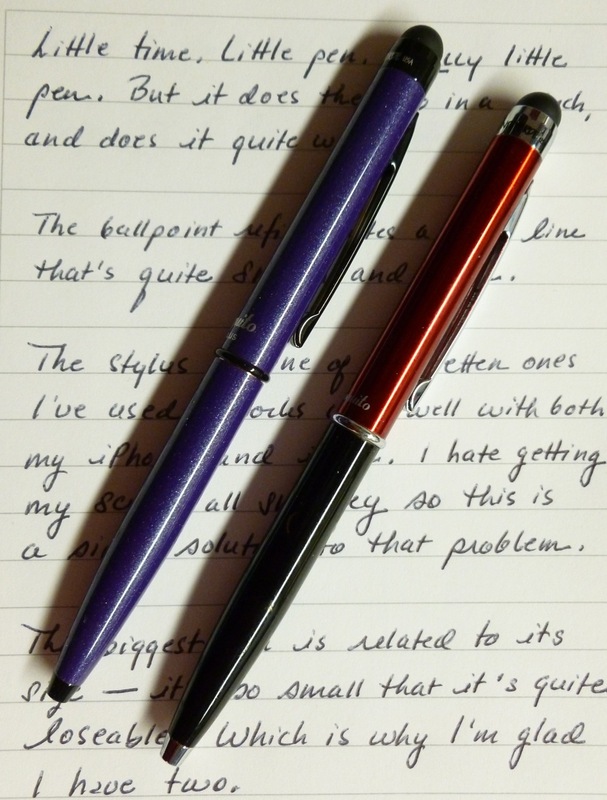 I’ve owned the red/black version for quite awhile (thus the dings), and amazingly won a door prize at the DC Pen Show which turned out to be the metallic purple version. 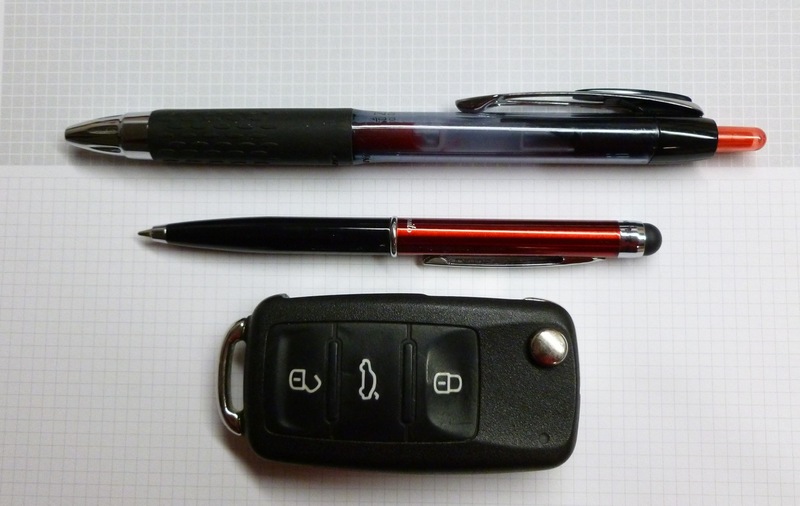 I’m especially glad to have two of these adorably teeny pens because it seems inevitable that I’ll eventually lose one. The Poquito is THAT tiny. 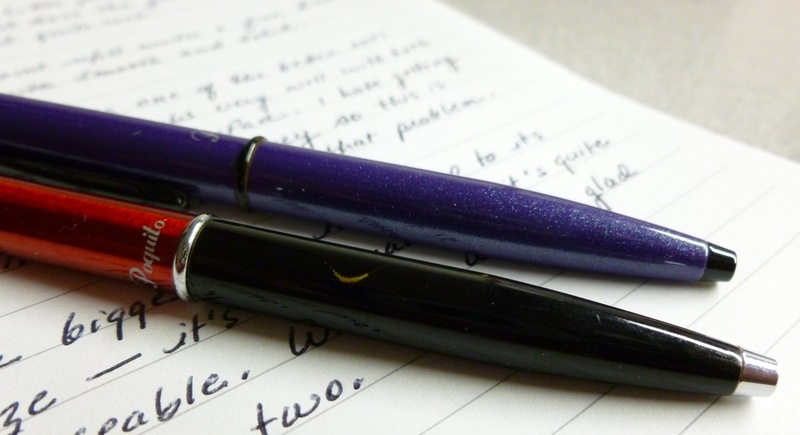 For all of its smallness, the Poquito is a very handy pocket pen. 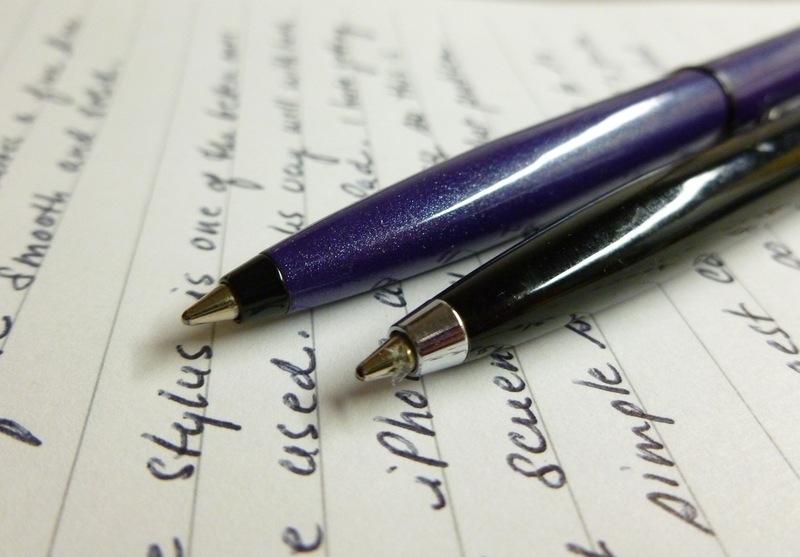 Need to jot a quick note? You’re covered. 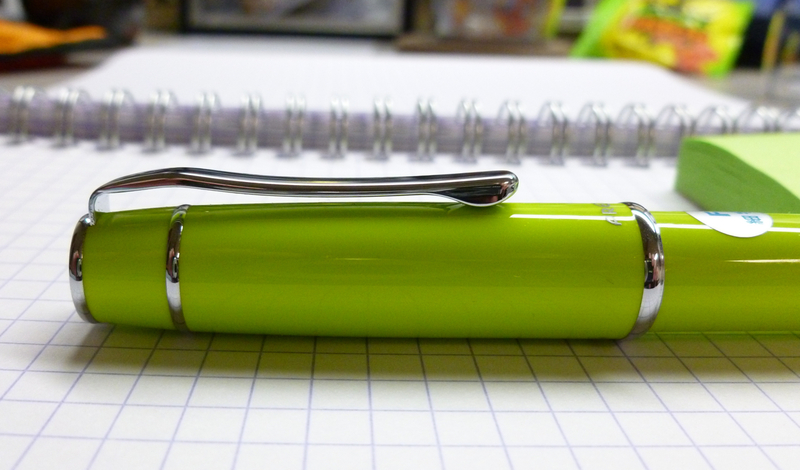 The 0.7 mm D1 refill is quite nice— smooth and fairly solid. If you click on the photo below, you can see some white in the line, but it’s not very noticeable on the actual page. 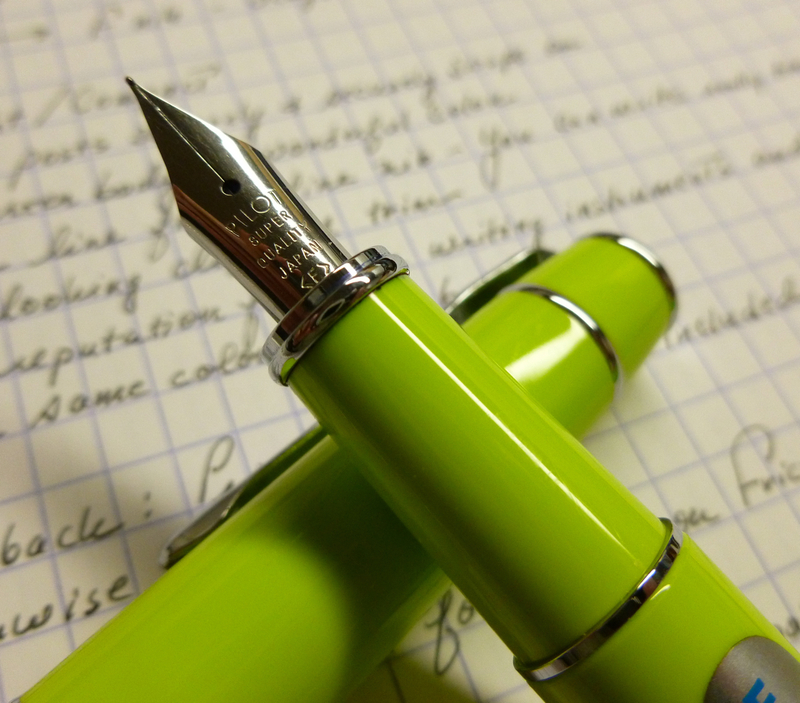 And let’s face it, you’re probably using this for notes and in quick bursts, not for extended writing. It’s pocketability is key. The stylus is a good one and has been coming in especially handy lately. Why? Well, because of the cold weather, I’m constantly slathering my hands with lotion, and lotion + iPhone/iPad screen is a messy combination. Using the stylus on the Poquito keeps my screens clean and smudge-free. I’ve also been cooking more lately (Thanksgiving!) and trying to answer texts and emails with messy hands is a pain. Again, the Poquito stylus to the rescue! The stylus responds quite well with just a bit of pressure. In all honesty, it’s one of my favorites, and certainly the most portable. 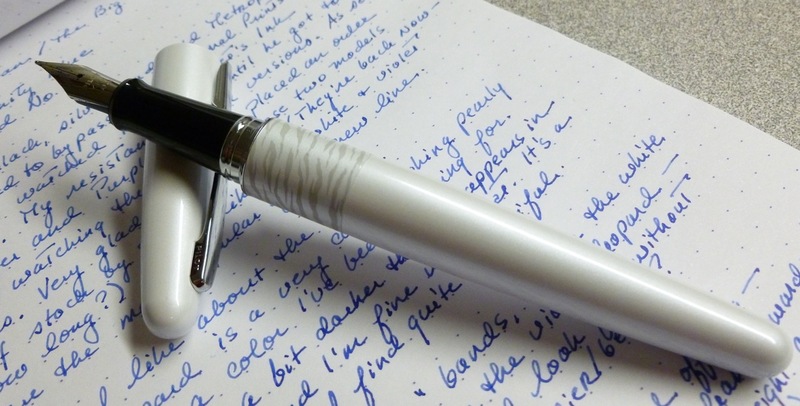 The writing tip deploys with a little twist of the pen body. It’s all very convenient. As you can see from the above photo, the Poquito spends its days in my pocket (yes, that’s pocket lint), ready for action. 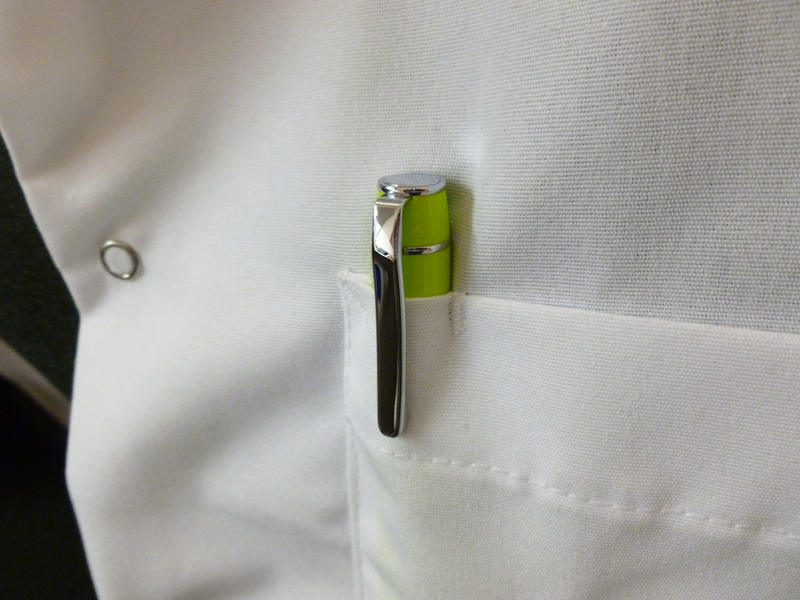 It’s unobtrusive and a great EDC tool. 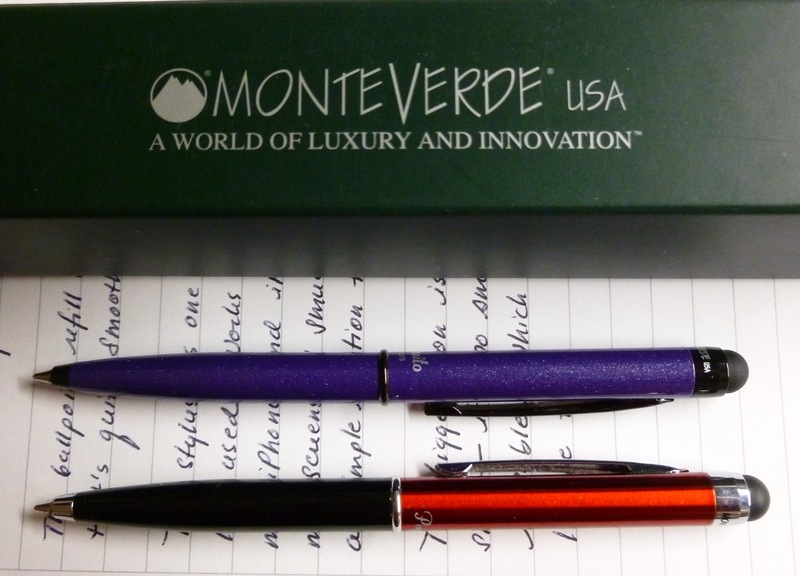 The Monteverde Poquito— a little pen that I like a lot. Why I didn’t take pictures of their table is beyond me. (Next time, I swear!) I guess I get so flustered by the pens! What’s cool is that Bob displays acrylic blanks next to some of his finished pens so that you really get to see how much the acrylic is transformed by the talents of the penmaker. While we were chatting, a woman stopped by the table and marveled at all of the choices and colors and styles. 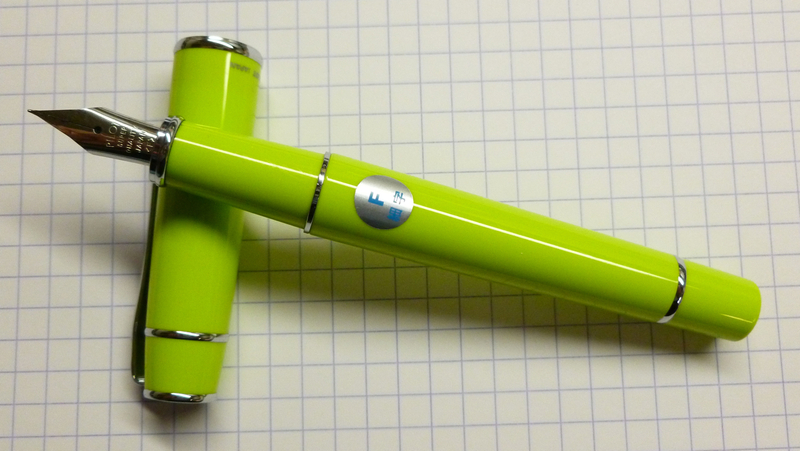 She ultimately walked away with a magnetic capped rollerball pen, much like the one I purchased last time. Good choice, wise lady! 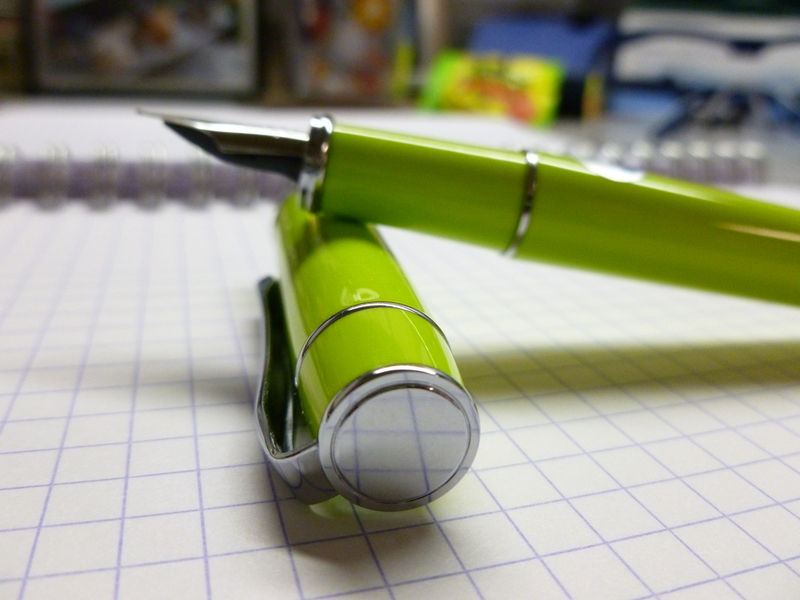 Even though I love the magnetic pens, I wanted to pick something different this time, so a pen decision had to be made. 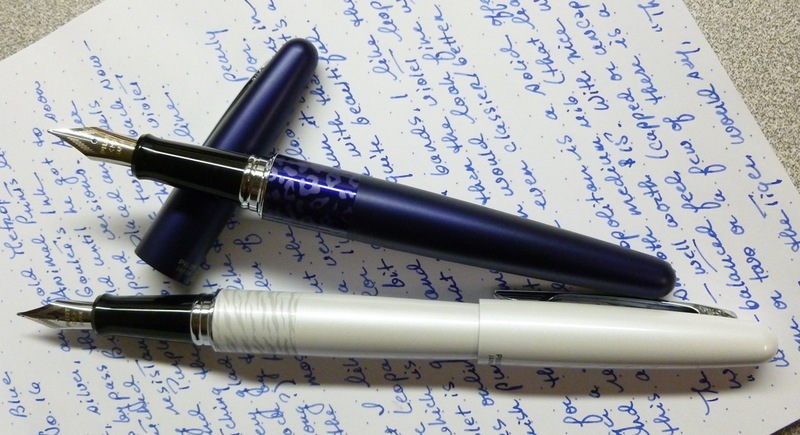 Trying to pick out one of Bob’s pens is like going to an animal shelter and trying to pick out ONE kitten. YOU JUST WANT TO TAKE THEM ALL HOME. They’re all so colorful and polished and obviously made with great care and love. (The pens, I mean, not the kittens.) Did I want wood? Or a colorful acrylic? Something with a stylus? Ballpoint? 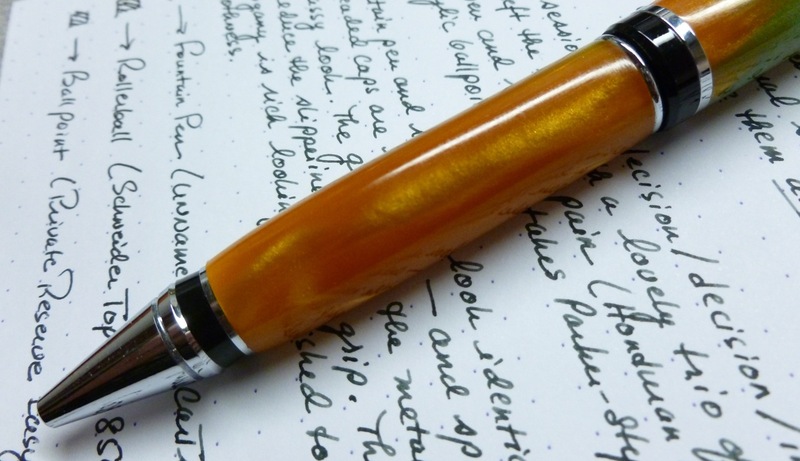 Rollerball Fountain pen? Hmmmmmm. What to choose. What to choose. 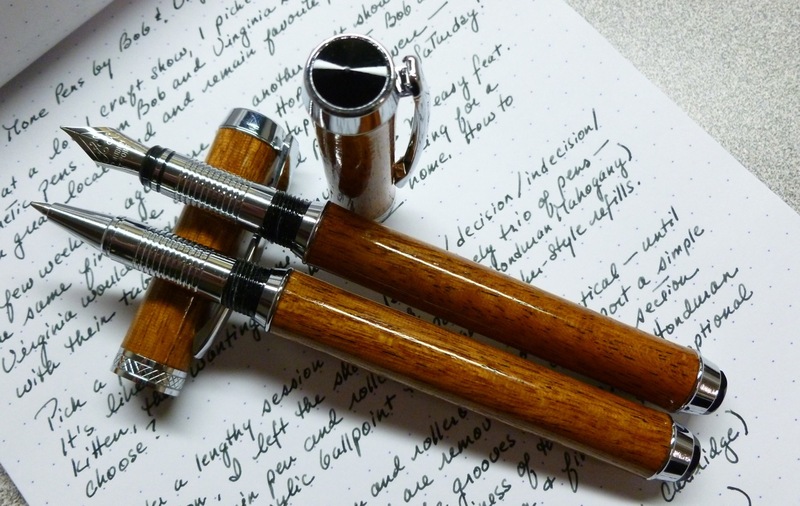 I eventually settled on a rollerball and fountain pen pair made from Honduran Mahogany. 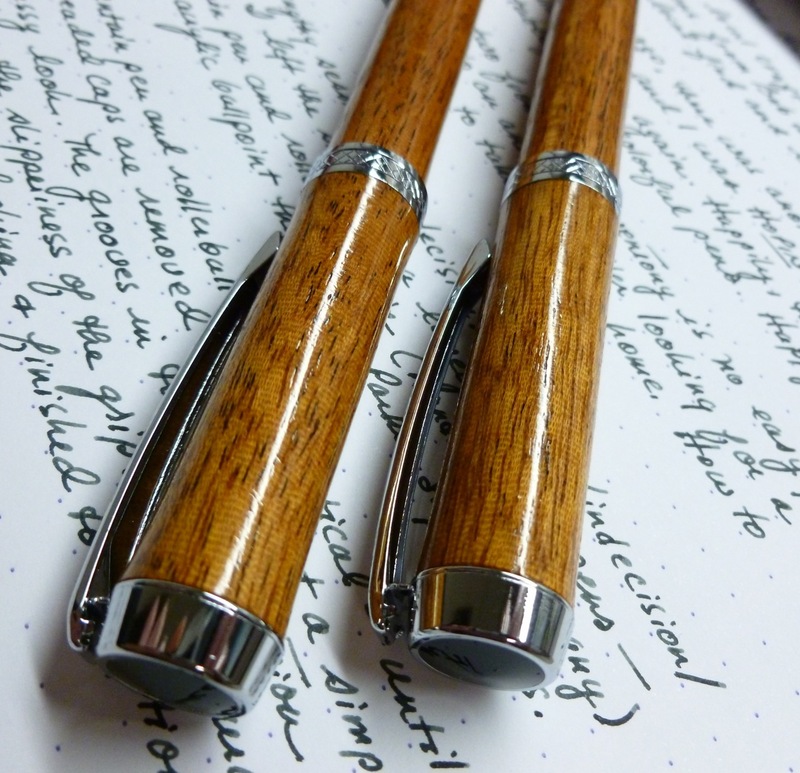 The pens are identical twins when capped, and are highly polished and coated so that they look and feel like fine furniture. SMOOTH. Trimmed with chrome and black accents, the look is simple but eye-catching. The grooved grip area makes the section much grippier than a plain metal section, and the clip is great-looking and wonderfully springy. 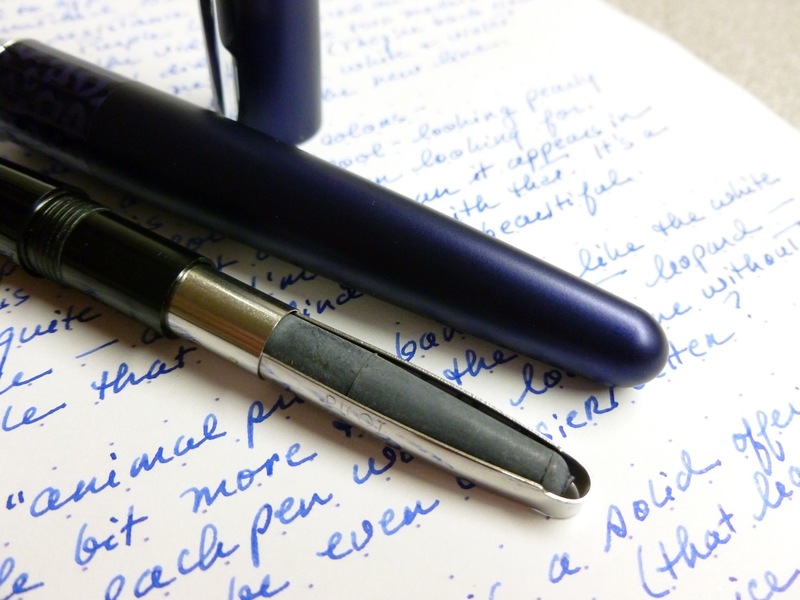 The rollerball takes a Schneider Topball 850, or a Staples brand Avant gel refill, while the fountain pen takes a standard cartridge or converter. Both write like champs. 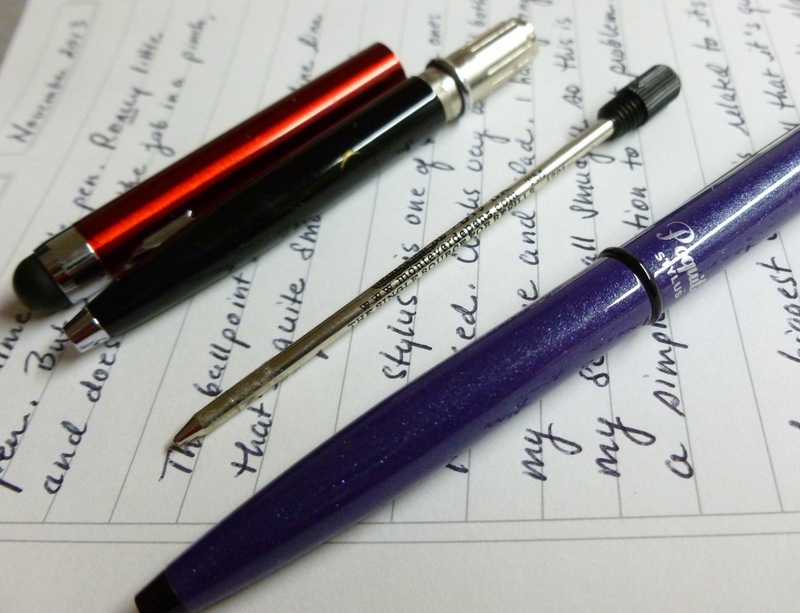 Bob obviously loves what he does, and wants to share his handiwork and love of pens, so his prices are more than fair. I paid $44.95 for this pair, which is a super deal. 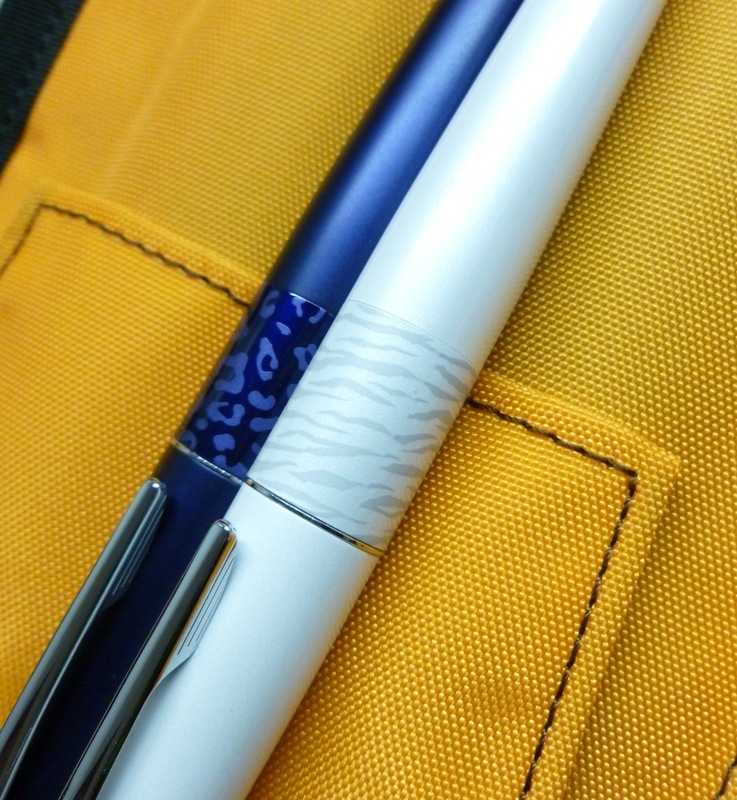 I also walked away with a gorgeous acrylic ballpoint that takes Parker-style refills and has been to and from work with me every day since. The acrylic is a summery swirl of yellow/orange and green and is a real mood booster. As the days get colder and darker, it’s nice to have some things that bring warmth and sunshine to mind, and this pen does just that. With a Private Reserve EasyFlow 9000 refill (my favorite—thanks, Mike Dudek) installed, it lays down a smooth dark line that’s pure ballpoint joy. We saw a lot of really cool crafts that day—from wooden jewelry boxes to soft fleece pillows to leather belts—but my heart will always go with the pen guy. Maybe that’s because Bob puts so much heart into his pens. 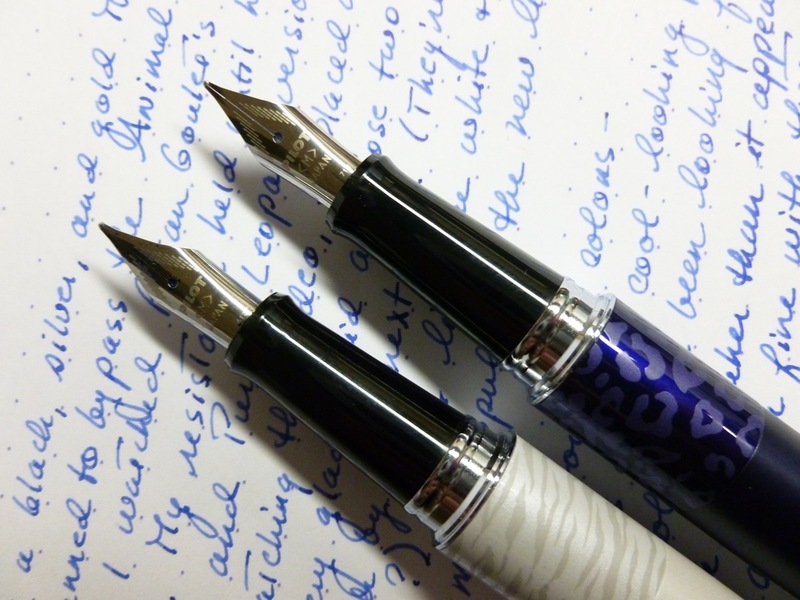 Though you may not be lucky enough to have a “Bob” in your backyard, Bob’s pens can come to you. Check out his website at pens4youonline.com. There’s free shipping within the USA! This is not a sponsored post. I’m just a happy repeat customer.